Lockable accessory rack for 6 pairs of 12lb. or 15lb. vinyl or neoprene dumbbells. Conveniently located on lower half of the Aerobic Pac allowing for the heavier weighted dumbbells. Weights Not Included. 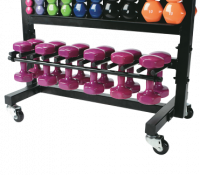 This Aerobic Pac rack comes with a lockable bar to secure your vinyl or neoprene dumbbells. Locking Bar (show in image) sold separately.